What Do I Need Before My First Visit? In addition to your essential contact information and any prior fitness experiences, we want to learn about your fitness goals, and (very important) any health issues you may have — back and spine especially — before starting your instruction. Small details can make a big difference in how I approach your training, so please try to be as accurate as possible. 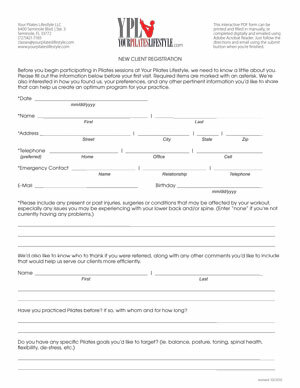 Using the form’s PRINT or eMail buttons, YPL’s New Client Signup PDF can be e-mailed directly and/or printed and turned in on your first visit. Just click the YPL intake form link here. The PDF will open in a new window or download to your computer, where you can open it in Adobe Reader and complete at your leisure. Please note: our form does not store any information, so before you quit Adobe Reader or close your browser window, you’ll need to email or print the filled in form or you’ll lose your work. Before your first class, you’ll need to complete your signup sheet and create a new user profile on our MindBody website. Both are quick and easy to complete, but if you should have a problem, or just have any questions, please get in touch. 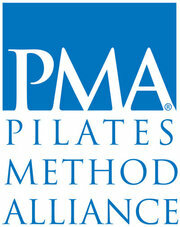 Please make sure you’re familiar with Your Pilates Lifestyle’s policies here. *How you see the New Client Signup Form PDF depends entirely on the browser you’re using. If your browser doesn’t support filling out forms online, just download the form, open it in Adobe Reader, fill it out, and e-mail.